Chhoti Si Asha is a social enterprise that works to build sustainable livelihoods for underprivileged women in the slum communities of Chandigarh, India. As part of the initiative, we run two programs – “Stitch-a-living” – a social enterprise where slum women are trained to make various kind of high quality handbags and home accessories, “Janta Colony Library” – an after school program for the children of the slum. As part of "stitch-a-living" - we train slum women to make high quality, chic marketable products like handbags, home accessories and fashion accessories. Our focus is to work with them on skills that they already have like stitching, weaving, crochet work, knitting etc and develop products that are marketable and chic. 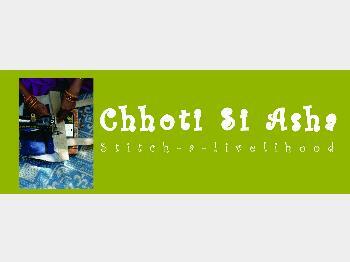 All products are made by the slum women  as part of the "stitch-a-living" program of  Chhoti Si Asha. - Once an order is places - the order will be dispatched in 2 to 3 days. If it is an order for a furniture item like a lamp or a pouffe or floor cushion, the time taken to dispatch can be longer (upto 7 to 10 days) - We will let the customer know the courier service being used. - A furniture item once sold will not be taken back unless something is broken - Bags once sold cannot be returned unless the piece received is broken or defective - Each product is unique as it will be made on order. - In case of a concern, please reach out within 36 hours of receiving the product, supported by images, and we shall be happy to help.